Please, to the Table What’s for dinner? Entrepreneurs Emily Golub ’06 and Mary Drennen ’02 have the answer: online food kits. Emily Golub ’06 and Mary Drennen ’02 created their online businesses right around the time Blue Apron and Hello Fresh hit the national scene, allowing consumers to bypass the grocery store and have meals delivered directly to their doorsteps. The trend shows no signs of slowing down, and each is growing her business to meet America’s appetite for delicious fare. 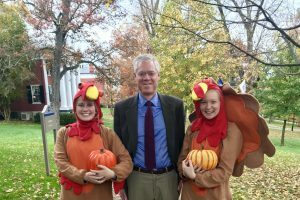 For Golub, that focus is on organic food kits to prepare at home, while Drennen’s business delivers fully prepared meals that just need heating up. So, sit yourselves down. Dinner is ready. 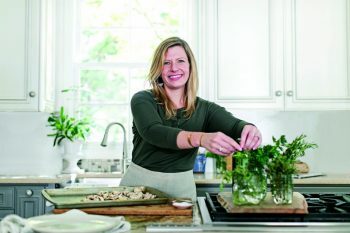 Emily Golub ’06, owner ofGarnish & Gather. Mary Drennen ’02, co-owner of Nourish Foods. 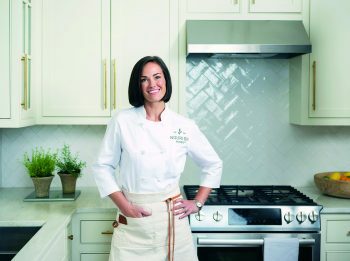 A graduate of the French Culinary Institute in New York City, Drennen is no stranger to the kitchen. As a college student, she worked in the restaurant kitchens in Birmingham, Alabama, and Charleston, South Carolina. “I have always loved food and the creativity of cooking from scratch,” she said. But after those summers, she knew she didn’t want a career in a restaurant. While working in the Cooking Light Test Kitchen in Birmingham, Drennen and a colleague started what she thought would be a small meal-delivery gig with a local gym. At the time, she had no idea it would lead to Nourish Foods, a Southern-inspired, direct-to-customer, fully prepared meal-delivery service. From two people, the company has grown to 25 and prepares and delivers over 6,000 meals per week, shipping them all over the continental U.S.
Drennen spends most of her time “in the weeds” looking at financial statements, corresponding with clients, reading contracts, reviewing press releases and advertising campaigns, and searching for the next piece of real estate to move her ever-expanding company into.